Thanks for your visit to us. As an ISO9001:2008 certified wheeled tractor manufacturer in China, we at YTO are able to satisfy all global customers by providing quality and economical tractors. Thanks to our decades of experience and tireless efforts, the sales and market share of our wheeled tractors have been the highest in our domestic market for many years. The lifting force of these products is 2.98KN, 3.2 KN and 4.2KN respectively. Our wheeled tractors are equipped with a double cylinder water cooled four-stroke diesel engine, which is fuel efficient. In addition, our tractors use a single disc clutch. For more detailed information, please refer to the parameter table below. 2) Compared with tractor of the same horsepower, this product features light weight, small volume, simple structure, and high cost performance. 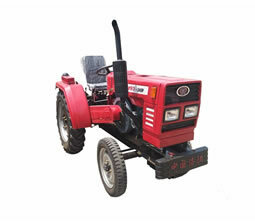 If you are in need of our 18-25HP wheeled tractor, please feel free to contact us. We at YTO are happy to assist you. Tractor with Loader Our tractor with loader is equipped with a water cooled engine, which features direct injection, glow plug and dual element air cleaner.